...With new record highs almost every week. This BSB is a larger "bite" than most - but it contains important data that you don't want to miss. Earlier this month, I discovered a website ( co2.earth) that provides a daily update of CO2 parts per million in the atmosphere - along with the 14 all-time records that have been set since 2015. The latest all-time record high of 414.27 ppm occurred on 2-9-19, at Mauna Loa - up from 408.99 last year on that date. And guess what? That's the sixth all-time record that has been set in 2019 - a blazing pace, averaging one new record per week so far this year. Not great news for today, my birthday, however. Dr. Wadhams comments on the new data. Surprised by that new CO2 info, I reached out to Dr. Peter Wadhams , one of the most eminent climate scientists in the world - and asked him if he might comment on these alarming statistics. Thank you for the message. I saw that statistic. It's not quite as bad as it looks, but it is frightening. The CO2 level at Mauna Loa (in fact anywhere) runs through an annual cycle because of summer-winter variability in plant growth. This 414.27 value occurs at peak time, so it is not always this high. On the other hand, the report rightly points out that 408.99 was the value at the same time last year, indicating a real growth of 5.28 in a single year, which I believe is the largest year-on-year growth rate ever. In other words, the dreaded exponential growth is happening, just at a time when supposedly CO2 growth rates should be diminishing as a result of the "actions" that the nations of the world are taking under the Paris agreement. A look at the "big picture." The graph below documents 319 years worth of data, turning exponentially upward around 1958, the year that "actual" data replaced the "ice core" data of prior centuries. 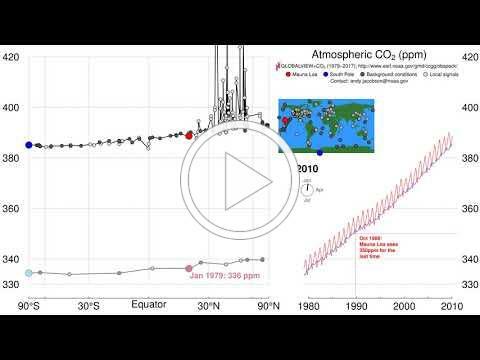 This Scripps graph, dated five days ago, covers CO2 data since 1700, well before the industrial revolution began. In another Scripps graph (using ice core data) it shows that CO2 ppm has never gone above 300 ppm for 800,000 years, until about 75 years ago. Now we're well over 400 ppm and climbing more rapidly than ever. What level is safe? You've no doubt heard of 350.org, an organization that was co-founded by the noted climate activist, Bill McKibben. It was named after the upper safe limit of CO2 in our atmosphere: 350 parts per million. Of course, we blew right past that "safe" limit about thirty years ago and none of the experts think we will ever go below 400 ppm again, much less 350. Notice the wild "pump handle" type fluctuations in the northern hemisphere compared to the steady rise of the blue dot at the South Pole (on the left). Complacency at the IPCC. Obviously, their approach to slowing climate change for the past few decades is not working. Focusing mostly on computer models instead of hard data, the panel meets once a year to make pledges which are not enforceable. Their approach of watching, pledging and hoping seems futile to me. Instead, they should be loudly and continually broadcasting the absolute necessity of reinventing a much "greener" habitat for humans. Reminds me of Nero fiddling while Rome burns and one of my blogs from five years ago. As we ponder the re-inventing of our civilization that would be necessary for coexisting with nature, it seems that we have four choices - ranging from doing almost nothing (current choice) to urgently coming together and doing all that is physically possible to begin living in harmony with nature. Choice #1. We ignore the world's climate scientists and just continue life as usual, earn money, buy stuff, have a good time and hope/pray for the best. Who knows, maybe all those climate deniers out there are right? Choice #2. Similar to #1, but we also donate heavily to environmental groups, drive electric cars, deploy lots of solar panels, take eco-vacations, recycle like crazy, water our big lawns less frequently and just try to be good citizens. We might also want to include some hoping and praying along with this choice as well. Choice #3. Bring together an international coalition and charge them with designing a human habitat that will retain many of our current luxuries - but will be just green enough to enable our ecosystem to continue sustaining our civilization and our species. Choice 4. Similar to Choice #3 but with one notable exception. Instead of aiming for being just "green enough," we demand that the international coalition design and build a human habitat that is as GREEN as physically possible, erring on the side of being "greener" than we have to be. Without a doubt, we must go with Choice #4 because we're likely going to have just one chance to get this right. We must pull out all the stops and commit ourselves to creating the greenest co-existence with nature that can be imagined. Why not Choice #3? Because if we modify our habitat to what we think is just enough to save ourselves, there's no way to know in advance if that plateau will satisfy Mother Nature. And like I said, we're likely to get only one chance. There are just too many variables to risk not doing all that we can possibly do. For if we don't urgently do all that we can do now, we'd be rolling the dice with the lives of the billions of children who will suffer mightily because of the excesses and short-sightedness of earlier generations. One more reason for Choice #4. Even doing all that we can possibly do may not be enough to save us. For it's entirely possible that there is no viable scenario for eight or ten billion people to live sustainably on this small planet. At least with #4, we will know that we gave it our best shot. So what about overpopulation? In Choice #4, what is the maximum human population that our ecosystem can support? Using Global Footprint Network data, I concluded that a sustainable level of human population would likely be around four billion - but only if we're all living about twice as green as the average European. how do we reduce it to four billion? No easy task for sure. Using a little third grade math, I computed that even if we could drastically lower the global birthrate from today's 360,000 per day to just 100,000, it would still take us 160 years to reach that 4 billion target. The Bottom Line. Most climate scientists are now agreeing that there is no possible way that we can stop or reverse climate change. Our options now are combinations of mitigation (slowing climate change) and adaptation -creating the best possible living arrangement for ourselves, an arrangement that can survive in a much hotter world, the likes of which humans have never seen before. That said, as described in Choice #4, we must pull together world leaders along with the best and the brightest in all fields of study and charge them with developing a global master plan for exactly how we can create a sustainable living arrangement for humans that can survive in harmony with nature - indefinitely. What might that master plan look like? In September of 2018, I drafted the "AGRA" approach that might be useful for that global coalition in helping to jump-start their thinking. It was simply the description of a thinking outside the box solution that just might work. For ALL 189 BSBs posted since June of 2016 , click here.